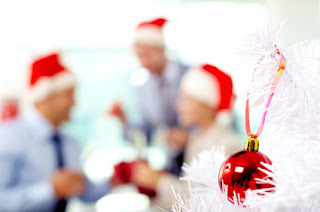 Brock CareerZone Blog: Using Time Wisely: Networking Over the Holidays! Are you all done exams/assignments and have nothing to do? Of course you're enjoying your free time after a crazy final month of the semester, catching up on much needed and overdue sleep. Maybe you're seeing your friends, family, and other loved ones. Or maybe you're like me and diving into a good book that you've been meaning to read since now you've got the time! But there are lots of other productive things we could all be doing over the holiday break and one of them is networking! 1. Holiday Parties: Tell EVERYONE what you do. You know those awkward conversations you always seem to have at holiday parties where you cannot wait to inch away AS SOON AS the conversation slows or someone breaks eye contact? Use them to your advantage! Figure out who is going to be at these parties and make sure you rub elbows with those who you think you can benefit from talking to career wise! Even people you don't know - you never know who THEY know! Talk to these people about what you're currently doing, what you hope to do and what your plan of action is - make an impression! Who knows what opportunities they might know about or even offer to you! 2. Holiday Greeting Cards: Send a Quick Update! Save the generic holiday greeting for passing people at the mall - in YOUR holiday greeting cards make sure to update everyone on what you've been up to and encourage people to respond with the same! By updating others and finding out what they're doing in return, you'll have an opportunity to hear about new fields of interest and also consider where you might fit into someone else's plans right now. And in the meantime, now is your chance to also update your career documents so they are ready for whatever opportunities might come your way. In all seriousness, there are lots of people off work right now and very few people looking for employment - take this opportunity to be on the top of everybody's list of hires when they get back to work! My advice - be ready! Happy Networking and see you soon! fantastic article..I really understand the concepts are clearly. Thanks for sharing informative post...keep update.. Thanks for sharing this useful information,its really useful to me..keep updating.